For those who are fans of the B Western movies, a Film Festival is a real treat. Enthusiasts from far and wide gather together for a weekend of good ol' fashioned fun, comradity and reminiscing. Cowboy heroes and heroines are admired not only in the movies that are shown in the viewing rooms, but in person as well. The highlight of these festivals is the opportunity to meet the stars up close and in person, and hear their fascinating stories of the making of these great B Westerns. Carolina Cotton was a guest star at several of these Film Festivals back in the 1980s and 1990s. She was always greeted warmly by many fans and friends. And there were a few reunions, with some of her former comrades: Gail Davis, Patsy Montana, Arkansas "Slim" Andrews, Gloria Henry and Sunset Carson were just a few of them. Carolina really enjoyed these festivals and looked forward to each and every one she attended. 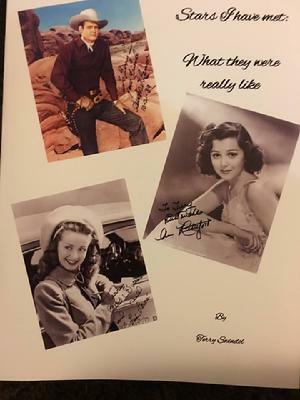 For those who "were there", it's easy to remember her lively perfomances onstage at the Banquets, or her enthusiasm to sign autographs at the vending tables. Below is a collection of photos from the many Film Festivals that Carolina attended. Most were sent to her by friends and fans. Unfortunately, not all were labeled with background info, or identifying the people pictured. If anyone can recognize who is featured, please email: info@carolinacotton.org and let us know. And if any of the photographers should recognize the photos they've taken, by all means tell us and we'll credit properly (of course, if you do not wish to have your photo featured, let us know so it can be removed). Special thanks to Bobby Copeland, Grady Franklin and Boyd Magers for their assistance in identifying these photos. Guest Stars: Carolina Cotton, Kirk Alyn, Nate "The Old Prospector" Booth, Reno Browne, Sunset Carson, Jimmy Ellison, Evelyn Finley, John Hart, Pierce Lyden, Richard Martin, Elaine Riley, Peggy Stewart, and the original Sunshine Boys. (Gail Davis and Jock Mahoney were scheduled but unable to attend. A shame, since Carolina has been in films with both of them and it would have been a fantastic reunion). Carolina's appearances at Film Festivals began when Harold Smith had invited her to attend a festival he was coordinating in 1983. Unfortunately, because of schedule conflicts, she was unable to attend. 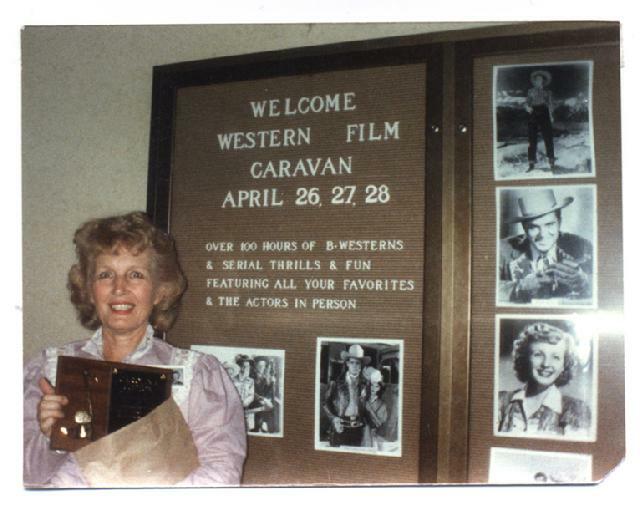 So Harold made sure that there was the chance to book her for the 1984 Festival--the Western Film Caravan in Atlanta, GA.
ROW 2, #4: Another flyer ad. #5: Carolina with Bob Lastinger in one of the film viewing rooms. #6: Tonto (Sammy Fulp) and the Lone Ranger (James Howard) join in for this shot. ROW 3, #7: Carolina poses with a few of the many Western Film fans: Nick Williams (middle back row, with beard); David Godwin, second from right, Sidney Hart (?) far right. #8: With Zulu Smith. #9: Carolina and Mike DeBerry. ROW 4, #10: Time for some refreshments! Drawing for prizes is Sherry Smith. #11: Award from the 1984 Atlanta Western Film Caravan. ROW 1, #1: Carolina gets a hug from Prospector Nate Booth, #2: Look, it's a Blue Canadian Rockies lobby card!, #3: Guest stars at the 1984 Western Film Caravan. 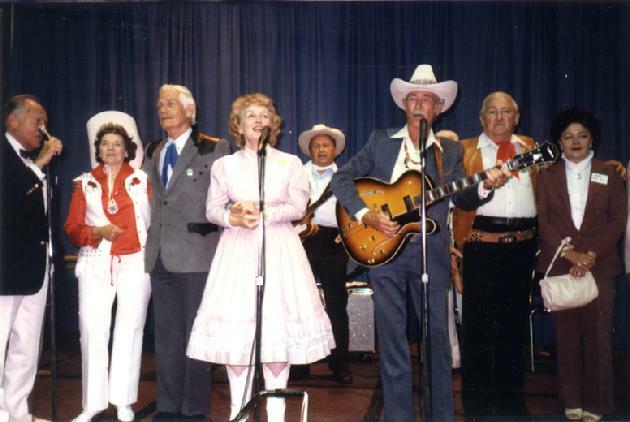 Back row: Peggy Stewart, Sunset Carson, Pierce Lyden, Kirk Alyn, John Hart; Center row: Reno Browne, Evelyn Finley, Carolina Cotton; Front: Elaine Riley. Row 4, #1: "Look, I've found another lobby card--Blue Canadian Rockies"; #2: Autographs from some of the guests appearing at the Festival, signed for Ms. Cotton's students at Mt. Vernon School. (A few guest stars were scheduled but unable to attend. Michael Ansara had conflicting schedules, and Shirley Patterson cancelled due to illness. Sadly, Names Craig died just one week prior to the Festival. He was remembered in Charlotte by his many fans and friends). 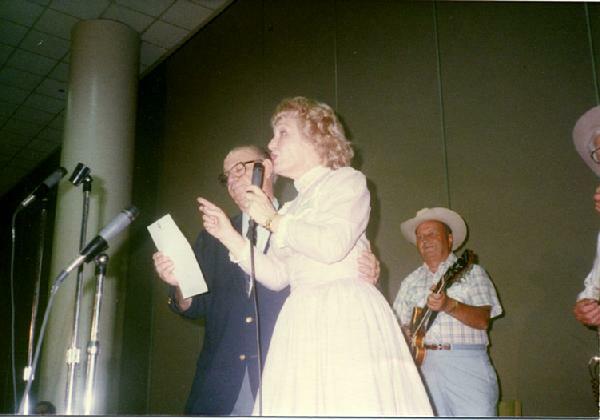 After her successful appearance at the 1984 Western Film Caravan in Atlanta, Carolina was soon contacted by Wayne and Shirley Short, to guest star at their Western Film Fair. 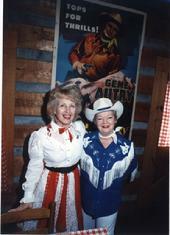 She happily accepted, and attended the 1985 Festival alongside some old friends, like Pee Wee King and Eddie Dean. ROW 2, #4: Gunfight at the ol' Hoosegow: The Frontier Cowboys put on a show in the hotel courtyard. The gunmen are James Howard (L) and Don Burress (R). #5: Carolina and friends in the courtyard. #6: "Hmm...should I autograph Leonard Kelly's arm, or the 8x10 glossy photo?" (That's Kelly's friend, Tommy Hildreth, looking on, far right). ROW 3, #7: "Okay, Leonard, no tattoos...I'll just sign the photo!" Sherman Pippin, center, catches a glance. #8: With a friend from the Jimmy Wakely Fan Club, #9: Pee Wee King (L) and Eddie Dean (Cntr) greet a friend...Claude Casey, of the Tennessee Ramblers. ROW 1, #1: One of the many autograph sessions, #2: One of Carolina's adoring fans, #3: Even Cabbage Patch dolls are fans of Western films! ROW 2, #4: At the Discussion Panel: Lash LaRue and John Russell recall the heydays of B Westerns, #5: Pierce Lyden and Carolina join in the discussion. #6: Audience members are more than welcome to ask questions to the Panel. ROW 3, #7: Pierce Lyden and Carolina: "Hey there, Lash, what's your opinion on this question?" #8: "Okay, if you insist..." Lash LaRue always had great stories to tell about the golden age of B Westerns. And he was quite a poet, often sharing one of the poems he wrote. #9: Carolina with a couple of Festival goers. ROW 2, #4: Carolina and another fan (possibly Juanita Carroll), #5: Eddie Dean, joined by the Tennessee Ramblers. The bike was later given away in a raffle. #6: The Ramblers jamming on some good ol' fashioned cowboy tunes. ROW 3, #7: The Yodeling Blonde Bombshell, doing what she's best known for--yodeling! #8: The crowd gives a standing ovation to the guest stars of the '85 Charlotte Film Festival, #9: Carolina with Evelyn Finley, and a couple of friends. Guest Stars: Carolina Cotton, "Arkansas" Slim Andrews, Rand Brooks, Eddie Dean, Oliver Drake, Ann Jeffreys, Lash LaRue, Alta Lee, Shirley Patterson, Wayde Preston, Cal Shrum, Tennessee Ramblers. (Gail Davis and Myron Healy were scheduled but could not attend. This Festival had lost one of its own, as VP Bobby Thompson had passed away. A special Tribute honored him.). Things went so well at the previous 1985 Charlotte Film Fair, that Carolina was asked back for the 1986 Festival. 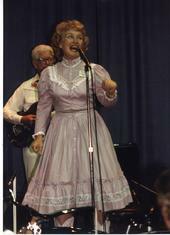 Once again, she shared the stage with Eddie Dean, Cal Shrum and the Tennessee Ramblers. Fellow Arkansas native, Slim Andrews, joined Carolina for a fun, after-hours jam session on "one of those new little Casio keyboards"! Many fans from the previous Film Fair attended this year's event. ROW 2, #4: Posing with a fan, #5: And yet another pose with a friend #6: Poster signings are always a highlight. ROW 3, #7: "Cabbage Patch dolls are still popular! ", #8: Carolina with Boyd and Donna Magers, and another friend (far right), #9: A friendly pose with a fan. ROW 4, #10: A discussion over Classic Images, with producer / director Oliver Drake. #11: Author David Rothel at a book signing...one of many at these Festivals, #12: Carolina and a an enthusiast 'neath the tree and the Jimmy Wakely sign. ROW 5, #13: "Just the 3 of us", #14: "Remember this beauty?" 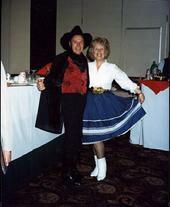 Claude Casey reminisces, #15: Carolina and lil' buckaroo Brian Park. ROW 6, #16: "Okay kids, here is your handwriting lesson for today...", #17: "Oh goodie...Miss Cotton just signed our note to our teacher to miss class! ", #18: Here's another Festival-goer in the lobby. ROW 11, #31: "Yodel-lee-da-ladee..." Bill Cline does a mighty fine job of yodelin'! #32: Signing a photo for Gary Kramer, #33: B Western fans come in all age groups. ROW 12, #34: Carolina shares a Kodak moment with Oliver Tucker. #35: Award from the 1986 Charlotte Western Film Fair. We'll continue to add more info on the many Film Festivals Carolina attended. A complete list of the Festivals and plenty of photos will be added in the near future. Check back soon! In the meantime, enjoy these other photos from a few of the Festivals. plus working for Access Hollywood. 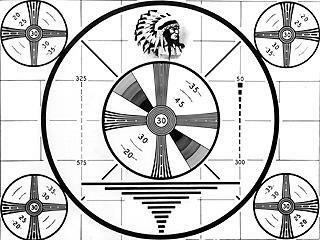 there,this will bring back some great memories. the Festivals. Lots of photos, too! (From top left) – Luster Bayless, John Pickard, Gene Evans, Gregg Palmer, "Arkansas" Slim Andrews, Michael Wayne and Gordie Peer. (Seated) - Gloria Henry, Carolina, Ann Rutherford and Alvy Moore. NOTE: These photos are just a sample of many that will be featured on this page, along with details about each Film Festival. Do you have any info or comments that you'd like to share about the above photos, or any of the Film Festivals Carolina attended? We'd love to hear from you!